Martini DN, Eckner JT, Meehan SK, Broglio SP. Long-term effects of adolescent sport concussion across the age spectrum. Am J Sports Med. 2017;45(6):1420-1428. PMID: 28298054. Buckley L, Bonar EE, Walton MA, Carter PM, Voloshyna D, Ehrlich PF, Cunningham RM. 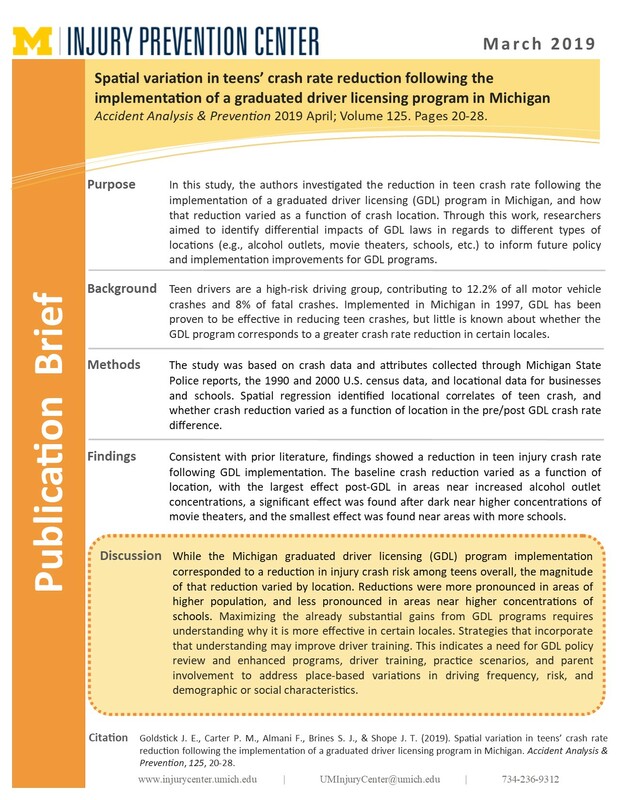 Marijuana and other substance use among male and female underage drinkers who drive after drinking and ride with those who drive after drinking. Addict Behav. 2017;71:7-11. PMID: 28231494. Benedetti M, Klinich KD, Manary MA, Flannagan CA. Predictors of restraint use among child occupants. Traffic Inj Prev. 2017;18(8):866-869. PMID: 28429962. Buckley L, Shope JT, Zakrajsek JS, Goldstick JE. 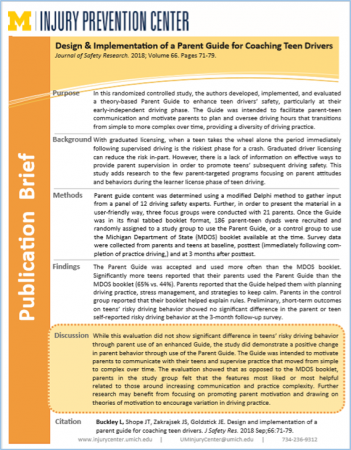 Design and implementation of a parent guide for coaching teen drivers. J Safety Res. 2018;66:71-79. PMID: 30121112. O’Connor KL, Peeters T, Szymanski S, Broglio SP. Individual impact magnitude vs. cumulative magnitude for estimating concussion odds. Ann Biomed Eng. 2017;45(8):1985-1992. PMID: 28455786. Brummett CM, Waljee JF, Goesling J, Moser S, Lin P, Englesbe MJ, Bohnert ASB, Kheterpal S, Nallamothu BK. 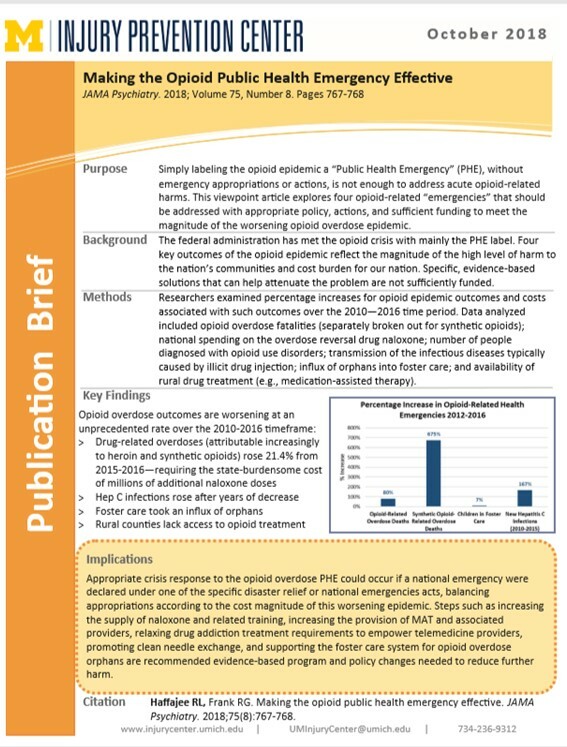 New persistent opioid use after minor and major surgical procedures in US adults. JAMA Surg. 2017;152(6):e170504. PMID: 28403427. McCabe SE, West BT, Veliz P, McCabe VV, Stoddard SA, Boyd CJ. Trends in medical and nonmedical use of prescription opioids among US adolescents: 1976-2015. Pediatrics. 2017;139(4). PMID: 28320868. Stack S, Rockett IRH. Are suicide note writers representative of all suicides? Analysis of the National Violent Death Reporting System. Suicide Life Threat Behav. 2018;48(1):12-20. PMID: 27982463. Britton PC, Bohnert KM, Ilgen MA, Kane C, Stephens B, Pigeon WR. Suicide mortality among male veterans discharged from Veterans Health Administration acute psychiatric units from 2005 to 2010. Soc Psychiatry Psychiatr Epidemiol. 2017;52(9):1081-1087. PMID: 28401273. Hilliard PE, Waljee J, Moser S, Metz L, Mathis M, Goesling J, Cron D, Clauw DJ, Englesbe M, Abecasis G, Brummett CM. Prevalence of preoperative opioid use and characteristics associated with opioid use among patients presenting for surgery. JAMA Surg. 2018 Jul 11. doi: 10.1001/jamasurg.2018.2102. PMID: 29998303.